University of British Columbia researchers have discovered two new symbionts living in the gut of termites, and taken the unusual step of naming them after fictional monsters created by American horror author HP Lovecraft. The single-cell protists, Cthulhu macrofasciculumque and Cthylla microfasciculumque, help termites digest wood. The researchers decided to name them after monstrous cosmic entities featured in Lovecraft's Cthulhu Mythos as an ode to the sometimes strange and fascinating world of the microbe. "When we first saw them under the microscope they had this unique motion, it looked almost like an octopus swimming," says UBC researcher Erick James, lead author of the paper describing the new protists, published in the online journal PLoS ONE. The octopus-like movements and appearance of both protists reminded James of the horrid Cthulhu and Cthylla, and the little protists were baptized after the two monsters. Cthulhu is often depicted as a giant, octopus-like entity with wings. Cthylla is his daughter, and has a similar appearance. 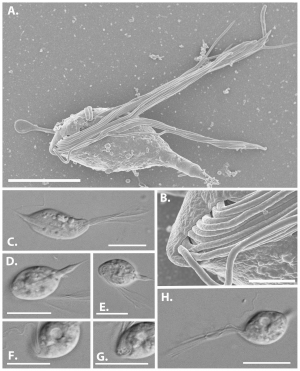 Most of the larger protists living in termites have already been identified, but Cthulhu and Cthylla are very small – they are in the range of 10 to 20 microns, while the bigger protists are around 50 to 150 microns – and had passed unnoticed until now. But although tiny, the protists and their brethren have a big impact, much like their fictional namesakes. "The huge diversity of microbial organisms is a completely untapped resource," says James. 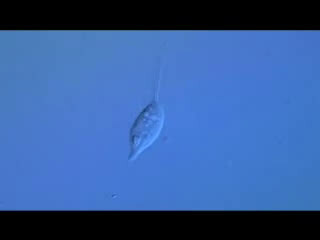 "Studying protists can tell us about the evolution of organisms. Some protists cause diseases, but others live in symbiotic relationships, like these flagellates in the intestines of termites."